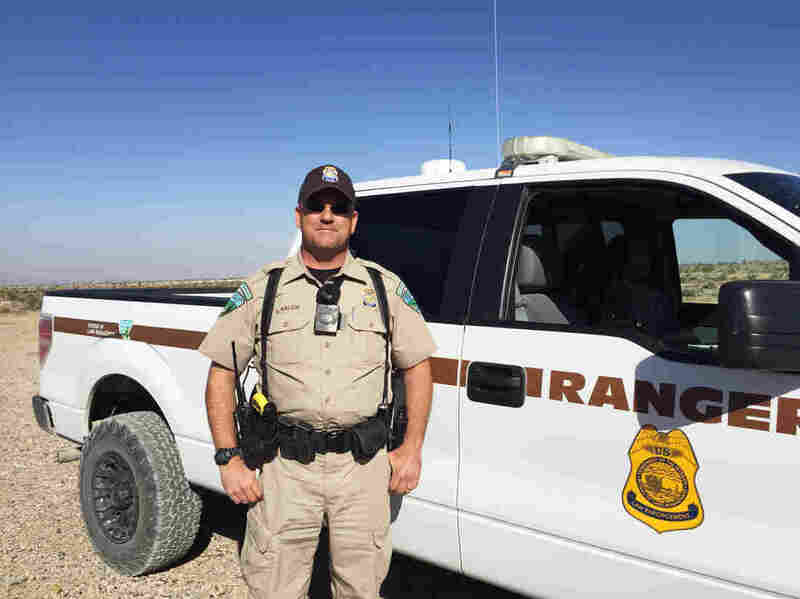 Federal Officers Face Hostility Amid Tension Over Control Of Federal Lands A reported spike in threats, intimidation and harassment toward federal officers in the rural West makes for a challenging work environment for one law enforcement ranger in southern Nevada. Bureau of Land Management Ranger Shane Nalen stands on public land that he patrols outside of Las Vegas, Nev.
Just after dawn, on a rutted out dirt road west of Las Vegas, Nev., Bureau of Land Management Ranger Shane Nalen steers his four by four over a small hill. "You never know what you're going to roll up on out here," he says, his dispatch radio squawking in the background. A panoramic view of the rugged Nevada desert unfolds. But there's also something peculiar. The desert carpet is lit up with reflecting lights shimmering in the soft morning sun. Nalen stops and hops out for a closer look. It's been a problem area for him, he says, pointing out the culprit, thousands of spent, steel shotgun shell casings. It turns out this is just one of scores of unofficial target shooting areas in Nalen's jurisdiction. Shotgun shell casings and broken glass litter part of Nalen's patrol area in the Nevada desert. Since the last time he visited, much to his chagrin, it's also turned into a trash dump. "We've got a couple of mattresses, looks like some hazmat," he says. "Somebody built a fire here." A home-made target is propped up on the arm of a Joshua tree. Someone spray painted part of the cactus. There's also a sign made by some volunteers that reads 'help keep this range clean.' You can barely make it out though through all the bullet holes. "It's ignorance, you have to respect the land," Nalen says. "This is complete disrespect, you've got to have somebody that's going to hold somebody accountable." That somebody is him. Except all he can really do today is search through the garbage and try to find an address or any other clue that might lead him to a suspect. It's not surprising to hear Nalen admit that he hardly ever gets to places in time to catch people in the act. After all, his jurisdiction is roughly a million acres of BLM land across the southern Nevada desert. This mirrors the agency nationally. There are only 200 law enforcement rangers, like Nalen, patrolling 245 million acres of BLM lands, mostly in the West. It's hardly a glamorous job, and it's not easy either. "I didn't get into this job to be a traditional cop," Nalen says. "I came into this job because I wanted to be the tip of the spear when it comes to protecting our resources." A Marine Corps veteran who studied forestry in college, Nalen has 14 years of conservation law enforcement experience under his belt, in the Mississippi Gulf and in Nevada. Here, about 95 percent of his time is spent in the field, on his own. He carries a survival kit with ready-made meals and other emergency supplies. If something goes wrong, backup could be hours away. He also carries an AR-15 and has regular law enforcement powers. Since the last time Nalen visited, the area has turned into a trash dump. Tensions over federal land management – and specifically the BLM – are as high as they've been in decades. The more high profile standoffs such as the seizure of the Malheur National Wildlife Refuge in Oregon and the standoff over cattle grazing near Cliven Bundy's ranch get the headlines. But government watchdog groups have tracked a steady increase in less high profile reports of threats and intimidation against federal land managers working in the field for the past several years. Nalen was one of the rangers at the Bundy standoff here in southern Nevada in 2014. His agency has barred him from talking about it, citing the upcoming trial. Nalen did say he understands there is a lot of anger toward the federal government right now, but that it's his job to try to engage with people to help them better understand why he's out here. "I think some of it is that you have people that have been used to doing things on public lands for many, many years, generational perhaps, but that doesn't necessarily make it right," Nalen says. 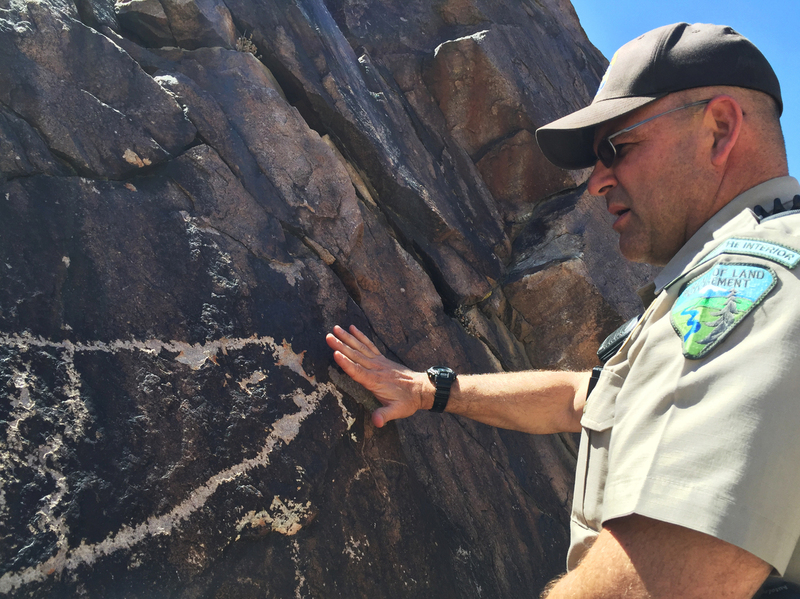 Late one afternoon on patrol north of his hometown of Pahrump, Nev., Nalen decides to pay a visit to a Native American cultural site to check on some ancient petroglyph paintings. He hasn't visited the spot for months. 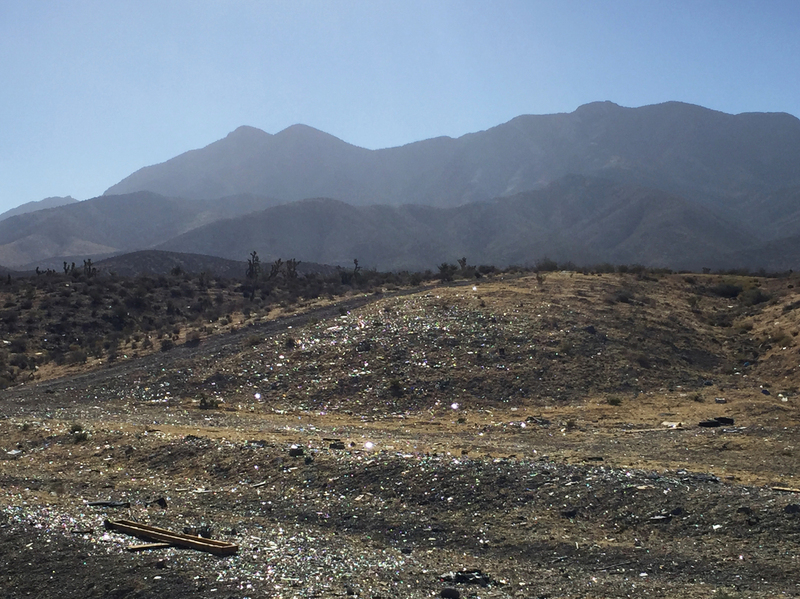 It's a bone busting detour several miles up what looks more like the remnants of a former riverbed than a road. "This is why I wear suspenders and I have pillows that I sit on," Nalen says, his voice shaking from the bumps. "After a while, it will wear your body down." Nalen inspects a damaged petroglyph at a Native American cultural site near Pahrump, Nev.
A half hour later, he's ditched the rig and is hiking across the baking hot desert toward a section of red sandstone cliffs. On one panel, there's an ancient drawing of an eagle, likely thousands of years old. But something's not right. Nalen shimmies up the rock for a closer look. "There's a good possibility that this little piece right here was shot," he says. "I'm looking for some shrapnel around the area." The possible work of vandals; one of the biggest parts of Nalen's job is fighting the desecration of some of the West's most important archaeological treasures. 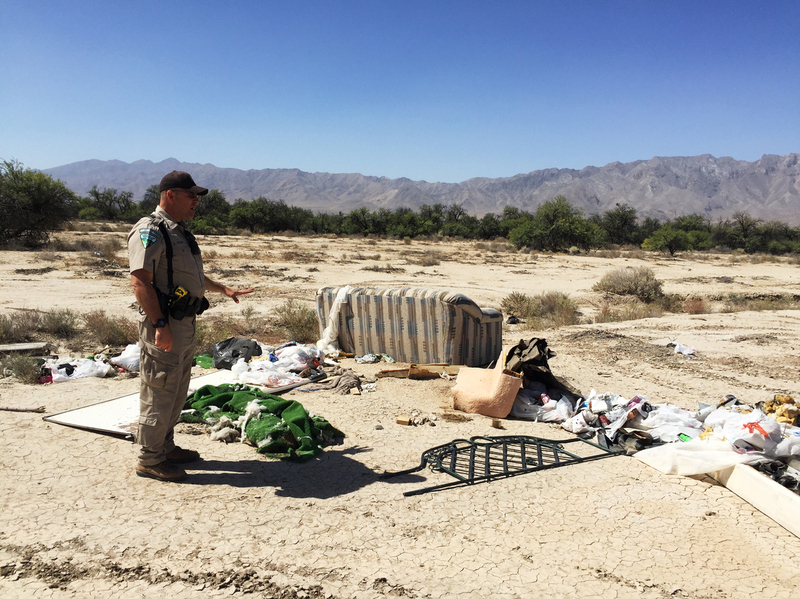 Like the trash dumps and other littering on public lands, this rarely is what makes the headlines nationally. "This is it," he says. "This is what we do. We're here to protect our public lands, our valuable cultural sites, that's why we're here." Again, all Nalen can do is document it. He takes some photos of the defaced rock panel. It's evidence. Then he gets ready for the long drive home.